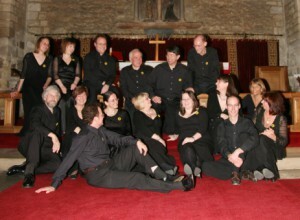 The chamber choir Polymnia (named after the Greek muse of sacred song) was formed when a group of friends decided to form a small choir which would sing to a very high standard. It was suggested that they start with a fund-raising concert in the parish of Northill, Bedfordshire in 2006, and they decided to go ahead after one of their members tested the church’s acoustics by singing the Habaňera from Bizet’s Carmen in the aisle, much to the surprise of the Vicar. John Byron was subsequently invited to become Musical Director. Since then Polymnia has gone from strength to strength giving concerts in Bedfordshire and beyond, usually raising money for charities, and often drawing on local musical expertise for guest instrumentalists and accompanists. The breadth of music Polymnia sings is extremely wide, dating from Renaissance polyphony to contemporary composers, and ranging from the classics to lighter numbers including folk songs, arrangements of songs from shows and musicals, and even film blockbusters by John Williams. One of their concerts, ‘Drums and Voices’, was a celebration of world music with songs from Africa, Hawaii and Sri Lanka, as well as contemporary European and New World music and items from the Spiritual and Gospel traditions. For this they were joined by a wonderful marimba player, Daniella Ganeva, and some amazing African drummers. Polymnia have recorded two CDs, and their performance of a Christmas motet by Mendelssohn is featured on the BBC Radio 4 website ‘The United Kingdom in Song’. 2010 saw their first visit to the Edinburgh Fringe Festival; performances included a wide range of choral music in the wonderful setting of St Marks artSpace. Under John’s vibrant direction the choir sang an inspiring selection of pieces, from Eric Whitacre’s haunting ‘Sleep’ and Mendelssohn’s ‘Kyrie Eleison’ to the rousing chords of John Williams’ ‘Hymn to the Fallen’ and a sensuous Argentinean tango, ‘Verano Porteno’ by Piazzolla. A return visit to Edinburgh in 2011 included the spine-tingling Allegri Miserere. In May 2012 they sang in the Barbican complex at St Giles, Cripplegate, in a performance of the Bach Magnificat with the London Charity Orchestra. This programme also included a full performance of Vivaldi’s Four Seasons with the young virtuoso, Thomas Gould. In 2013 they went to Croatia, where they sang in the Istra Music Festival. In 2014 they travelled to Spain as part of the “Music in the Mountains” Festival, where they sang in the caves at Nerja and gave a concert in the cathedral at Granada. They also had a training day with Stephen Cleobury and an opportunity to sing in the wonderful acoustic of the chapel at Kings College Cambridge. In 2016 they performed in the prestigious Mantova Chamber Festival in Italy, giving three successful concerts in the Basilica of the Ducal Palace where Monteverdi lived and worked.